Apple Music has launched its ‘Preferred Distribution Program’. 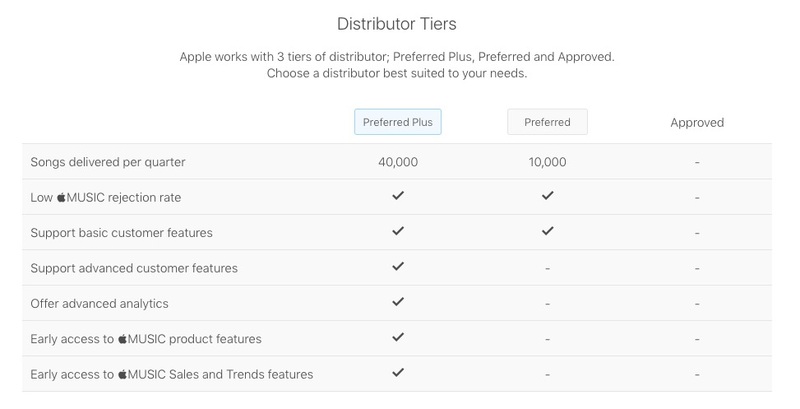 In order for other distributors to become a “Preferred Plus” partner, they will be expected to cross a threshold of 40,000 songs per quarter with a low Apple Music rejection rate, among other service based criteria. To be a “Preferred” partner, the criteria are similar but the distributor need only cross 10,000 songs per quarter. You can see an image outlining the criteria in greater detail below. This move from Apple Music follows a similar move from fellow streaming giant Spotify, who recently revealed its own ‘preferred’ digital distributor list. All of this could also indicate, on a speculative basis, that Apple Music could soon be following in the footsteps of Spotify in introducing a feature that could allow independent artists upload their own music without any need for a record label or third-party aggregator. While Spotify’s introduction feature is still in it’s Beta stages, it was revealed last week that in order for artists to fully avail of the service, it is likely they will have to pay. Apple have, as of yet, made no statement as to whether they could be heading in this direction.